Your monthly link to the latest information on the products, services, and training opportunities from the American Printing House for the Blind. Exciting New APH Products Announced! Read on to learn about these new products - now available! APH Introduces DAISY Online in USA for Book Port DT! APH is excited to announce the first U.S. implementation of DAISY Online! This amazing service utilizes the features of the new Book Port DT to provide users the ability to find, download and play DAISY content without the need for a computer! DAISY, or Digital Accessible Information System, is an international standard for the Digital Talking Book (DTB). The debut of DAISY Online brings Newsweek and Readers Digest—which APH has provided in braille and audio formats free of charge for many decades—to the Book Port DT! In addition, DAISY Online makes available, to those Book Port DT users who are registered with Bookshare, access to Bookshare’s collections of accessible books, newspapers, and more. Bookshare currently provides access to more than 175,600 titles. We are also pleased to share that the Migel Library has now made over 1,000 books from its research collection available free of charge in DAISY format. The Migel is one of the largest historical collections of non-medical books and magazines related to blindness in the world. Those titles, which already are available on the web through the Migel website, will be made available via Book Port DT soon. Visually impaired and blind artists of all ages are invited to submit artwork for our twenty-second annual international art competition, APH InSights 2013. Last year, over 400 entries were received. From these, jurors selected over 80 pieces for the exhibition, which was shown in Louisville at the Annual Meeting last October. From the works selected for display, 32 award winners were chosen and a number of artists and their families visited Louisville to receive their awards in person at APH’s Annual Meeting. Artists may enter original artwork created in any medium, including (but not limited to) painting, drawing, printmaking, fiber, metal, or wood. The deadline for entries from students in kindergarten through high school is March 25. Adult artists have until April 1 to send in their entries. If you have questions, please contact Roberta Williams at 502-899-2357 or rwilliams@aph.org to receive a copy of the rules and application forms by email, or a hard copy in print or braille. The Hall of Fame is still accepting nominations for 2013 induction consideration. If you are interested in learning more about the process for submitting a nominee to join the 50 inductees, please visit: www.aph.org/hall/nominate.html. The nomination process will close March 29, 2013. "The Hall of Fame for Leaders and Legends of the Blindness Field is dedicated to preserving, honoring, and promoting the tradition of excellence manifested by the specific individuals inducted into the Hall of Fame and through the history of outstanding services provided to people who are blind or visually impaired." Don’t Miss Out on Your Chance to be the Next Unforgettable APH Star! The February 13th deadline of the Winter 2013 Unforgettable APH Star Video Contest is fast approaching! If you have longed to be in the spotlight, and are totally pumped about showing the world your favorite APH product, now’s your chance to make your statement! This contest is open to individuals and groups of all ages. Make it into a school project, a family activity or a creative venture with your BFF! Go to www.aph.org/contest for more information. Are you going yet? Field Testers are needed to evaluate a prototype of a new leisure activity game for children and students with CVI. The game is called "Match Sticks," and requires the use of a black Velcro® brand compatible surface such as the APH All-In-One Board or APH Invisiboard. Please note that Velcro® brand compatible boards will not be included with the field test materials. "Match Sticks" is designed for students with functional vision corresponding to Phase II or Phase III of the CVI range established by Christine Roman-Lantzy (Roman-Lantzy, C. (2007). Cortical Visual Impairment: An Approach to Assessment and Intervention. New York: AFB Press). Number of children/students who can participate; please state the phase of each child, according to assessment procedures in the reference above. Thank you and we look forward to hearing from you! Complete a questionnaire about the device. Thank you for considering this opportunity to assist us with a potentially valuable new product! Introduction section from our latest traveling exhibit, Child In A Strange Country. "Child in a Strange Country: Helen Keller and the History of Education for People Who Are Blind or Visually Impaired," the latest traveling exhibit from our museum, is headed to Austin, Texas, this spring for its first installation outside Louisville. Hosted by the Texas School for the Blind and Visually Impaired, the exhibit is tentatively scheduled to open in April and run through May. "Child" explores classroom tools and techniques through the lens of the educational journey of author and activist Helen Keller (1880-1968). The beautiful design is accented by touch tables, audio labels narrated by Talking Book legend Mitzi Friedlander, quotes from the ever-quotable Ms. Keller, and unique tactile reproductions of early books and maps. The show is available to travel to museums, libraries, residential schools, and other community centers. Details on hosting the exhibit are available at http://www.aph.org/museum/traveling.html. For additional information, call Mike Hudson at 502-899-2365 or email mhudson@aph.org. APH Museum Acquires "Musical Art"
An example of the raised letter font used in Marx’ Universal School of Music. It is significant due to the use of standard capitalization rules, uncommon before 1875. APH believes in collaboration and cooperation with its partners in the blindness field, and that preference has deep roots in the company history. The latest acquisition in our museum is a good example. The museum purchased Adolph Marx’ The Universal School of Music; A Manual for Teachers and Students in Every Branch of Musical Art from a rare book dealer. Published in raised letters in 1877 in Louisville by the Printing House, the book was originally typeset by legendary printer Napoleon Kneass in Philadelphia for the National Association for Publishing Musical and Literary Works for the Blind. Kneass was blind himself and published one of the first tactile magazines in the United States. According to APH annual reports, the National Association had "joined" with APH in 1872 and its publications were listed in our catalog by 1875. Kneass had embossed 100 copies of the title in 1876, which were sent unbound to APH. Additional copies were subsequently produced by APH—as a second edition—using Kneass' original stereotype plates. This example comes from that second edition, and is the only example in our collection with markings from both APH and the National Association, a tactile bit of evidence of an important early partnership. The Universal School of Music was purchased with help from a generous donation by former APH staffer Pat Campbell. The Getting to Know You curriculum engages students who have visual impairments with sighted peers in activities to promote social interaction and ability awareness. The product is designed for TVIs, O&M specialists, service personnel, general education teachers, and families. This free NIP Event is held as a KAER pre-conference workshop. The KAER Conference begins the evening of March 13. Attend this NIP Event and then stay for KAER! Don't miss the opportunity to learn from some of the nation's leading experts in the field of braille transcription and production. With 24 intense workshops over the course of 3 days, the invaluable resources and helpful handouts will be crucial information for transcribers, teachers and students alike. Topics:Braille Formats Tactile Graphics, Literary Braille, Math and Science, Foreign Language, Music, UEB Overview. GUAM: "Hafa Adai" to APH News Readers! Most of the APH product training, conducted by Janie Blome of Field Services, was hands-on and interactive. Here, two students report the uses they would find for the VisioBook Portable Electronic Magnifier. APH recently conducted the company's first-ever training in a United States outlying area in the Pacific region. As background, eligible students in five U.S. outlying areas may be registered to receive Federal Quota funds: those residing in American Samoa, Guam, Northern Mariana Islands, Puerto Rico, and the U.S. Virgin Islands. At the invitation of Glinda Hill, representing the Office of Special Education Programs (OSEP), and June De Leon, representing the University of Guam CEDDERS Pacific Vision Instruction Project, APH staff members conducted training during the week of January 7, 2013, in collaboration with Laura Bozeman and Bob McCulley of the University of Massachusetts Boston Northeast Regional Center on Vision Education, who provide the ongoing instruction at the University of Guam. The APH training targeted the 20 Scholars of the Pacific Vision Impairment Project from Saipan, Chuuk, Pohnpei, Kosrae, Guam, and American Samoa who are receiving instruction to become teachers of visually impaired students. Also participating were the two Ex Officio Trustees of Guam and Northern Mariana Islands, as well as approximately 45 other teachers and administrators from the Pacific region. The workshop included a history of APH and the Federal Quota program, an overview of the APH website and shopping site, an extensive hands-on training session with dozens of APH products, and a discussion of possible resource sharing among the islands. We were struck by the enthusiasm of the participants, the generosity of our hosts, and the beauty of the University of Guam campus. We were very sorry to say "Adios" to this jewel in the Pacific! "Si Yu'us Ma'ase!" (Thank You!) to everyone who made this unique visit possible! The Guam training group included (left to right): Janie Blome, APH; Tuck Tinsley, APH; Yolanda Gabriel, EOT for Guam; Tim Thornburgh, EOT for Northern Mariana Islands; Mary Beth Dean, University of Massachusetts; June De Leon, Guam CEDDERS; Scott Blome, APH; June Quitugua, Guam CEDDERS; Bob Brasher, APH. The HANDS ON Kit: Functional Activities for Visually Impaired Preschoolers helps children develop skills such as concentration, hand and visual coordination, ability to complete a cycle of activity, and socialization skills. The kit also helps develop a sense of order and a positive self-image. This product includes six specially designed plastic trays; a work tray, a two-section tray, a bowl tray, a sorting tray, a stringing tray, and a multi-section tray with flashlight insert. The philosophy in the included HANDS ON guidebook incorporates many Montessori principles. The activities in the handbook encourage blind and visually impaired preschoolers to function independently, but do not require the student to perform in isolation. Many of the activities lend themselves to small group or side-by-side play. The work is presented sequentially, beginning with simple tasks such as pouring beans to more complicated tasks such as preparing snacks. The tasks outlined in the HANDS ON guidebook use the included trays and commonly available materials and can be performed in the classroom or at home. The guidebook is available as a free-of-charge PDF file download, which you may print as needed. Visit our downloadable manuals page at http://www.aph.org/manuals/index.html. If you have any suggestions for other products you would like to see highlighted in this monthly feature, please send your comments to Monica Turner at mmturner@aph.org. APH’s Jane Thompson Acknowledged with MACRT Award! The Mid-America Conference of Rehabilitation Teachers (MACRT), founded in 1947, is an organization of rehabilitation professionals. In 1983 the Charlyn Allen Award was initiated to provide peer recognition for outstanding achievement, dedication, and leadership in the field of Rehabilitation Teaching. Charlyn Allen worked in the field of rehabilitation teaching for 35 years. Mrs. Allen was President of MACRT in the late 1950s and assumed a leadership role in all of MACRT's Conferences as well as other groups relative to rehabilitation teaching. This year at the MACRT–ASERT Professional Development Conference in Kansas City, MO, Jane Thompson, Director of the APH Accessible Textbook Department, was awarded the Charlyn Allen Award. Jane was a founding member of the Association of Southeast Rehabilitation Teachers (ASERT) in 1994, while living in Atlanta and working for Blind and Low Vision Services of North Georgia. "Jane’s commitment to professional development is outstanding and she continuously strives to help others expand their resources and knowledge base. Jane truly embodies professionalism," said Jennifer Ottowitz, CVRT, Milwaukee, WI. Jane currently serves as Vice President of MACRT and Coordinator for ASERT. Congratulations, Jane! The APH Barr Library supports research initiatives at APH, while the Migel Library is one of the largest collections of nonmedical information related to blindness in the world. Although the collections do not circulate, arrangements can be made to use the materials on-site. In addition, an ongoing digitization effort means APH will continue to make materials available through the online catalog at http://migel.aph.org. Two of the many "Treasures from the APH Libraries" are described below. From the Barr Library: Nolan, Carson Y., and Amie L. Dennison. Final Technical Report, Instructional Materials Reference Center for Visually Handicapped Children. Tech. Louisville: Bureau of Education for the Handicapped, Office of Education, 1974. The Final Technical Report describes in detail the development, research, and reference work of APH’s Instructional Materials Reference Center from 1966 to 1974. This work included lending and distribution of materials to teachers of the visually impaired, materials reference service, and research and development activities. A bulk of its 391 pages breaks down and explains research activities in eight distinct categories. The report concludes with an item-by-item list of APH products with the personnel, purpose, research procedure, and description of each. From the Migel Library: Talking Book Topics. Volume 37, Number 5. New York: American Foundation for the Blind, 1971. This 1971 print issue of Talking Book Topics was published by the American Foundation for the Blind for the Library of Congress. Like other issues of the era, it was published in large print and distributed free of charge to users of the National Library Service. This copy still contains a flexible record that was inserted in the pages, which is also common to the time. What makes this item most significant are the notes contained within it. The copy has been heavily edited by hand, and insightful notes have been added to several paragraphs. Even more unique and interesting is an interoffice note that was found in the pages, explaining that some of the editing was due to "the Division’s rather child-like approach to writing to the readers of talking books." New Links to Product Videos Added! We’ve added links to several additional videos created by talented student Chase Crispin and his teacher LeAnna MacDonald. Visit our redesigned products video page to view these videos, covering the Book Port DT, Braille Plus 18, and Refreshabraille 18. Some Ex Officio Trustees prefer to use their own order forms customized for their state’s particular needs, but APH also offers a generic Quota Order Form. We’ve recently revised this form and you can download it as a PDF. If you have questions about Federal Quota ordering, please contact Marsha Overstreet, Customer Relations Department, moverstreet@aph.org or 1-800-223-1839. Preview and download the podcast Nick News with Linda Ellerbee on iTunes. Read episode descriptions and customer reviews. "Like" APH at Our Facebook Page! We invite you to visit our Facebook page and "Like" us! You can find APH at these social media sites: Twitter, YouTube, Flickr, and at our blog, Fred's Head from APH. Shelly Faust-Jones, the Pennsylvania Bureau of Blindness and Visual Services, a new Federal Quota account beginning with the 2013 census. William "Bill" Koehler, the Arizona State Schools for the Deaf and the Blind, replacing Samuel Ace. Load up a world of savings on selected APH products with APH's Winter Wonderland Sale 2013, January 1—March 31. As always, first come, first served. Get the manual you need instantly! APH offers a selected list of product manuals available for free download (www.aph.org/manuals/). You may print or emboss these as needed. We will continue to package hard copies of these manuals with their products and sell hard copy replacements. Note: see the end of this listing for special ordering instructions. An Android app that empowers the user to independently explore, discover, and enjoy their neighborhood and beyond with poise and confidence! APH is excited to announce our first individually-sold mobile application for Android! We offer a number of applications bundled as a part of our popular Android-based Braille Plus 18™ mobile manager, including Nearby Explorer. Now you can purchase this powerful location exploration app separately for use on your Android phone! Use Nearby Explorer to explore and navigate independently as you walk or ride in a vehicle. It includes built-in maps covering millions of points of interest in the United States and Canada. You can also add your own points of interest. Nearby Explorer uses GPS and your phone's compass to speak real-time information about your surroundings. It also displays maps on the screen. Nearby Explorer makes independent travel for blind pedestrians and passengers efficient, informative, and fun! It includes surrounding and approaching streets, businesses, institutions, and public facilities; and continually updates distance and direction to the nearest point or to a selected point. It enables the blind passenger in a vehicle to aid the driver with directions and suggestions. All announcements are optional, so you control how much information Nearby Explorer is giving you. Since your Android device knows your current location and the location of places of interest around you, you can point your device toward features in your environment and receive feedback about them. Think of this feature as a virtual "beam" emitting from the end of your device that "scans" your environment! The GeoBeam feature requires a device with a compass. Increases awareness of your exact position by announcing the street and address number of your current position and keeping you updated with movement. Increases your sense of distance by updating distances to selected places as you walk. Improves spatial awareness by looking ahead and announcing the distance and direction of upcoming streets. Improves knowledge of your surroundings by showing the distance, direction, name, and address of the nearest place either in the built-in maps or in places set by you. Increases flexibility by discovering the surrounding streets with the compass that engages when you orient the device vertically. Announces the next street and its distance and direction where the compass is pointed. Improves orientation to surrounding businesses by letting you point to a marked location and providing vibrating & auditory feedback. Guides the user to a selected destination and provides a list of directions to a selected destination. Search for places, streets, and addresses. Explore the map by intersections, all streets, or all streets from 1 or 10 miles away. Shows the direction you’re heading ("North," "Southeast," etc.) and your speed. Tracks a selected place and provides the distance and direction to get there. Note: Street addresses are approximate relative to your position. They are calculated using a relative distance from the beginning to the end of a block, so house numbers may not be exact. Note: A built-in compass is not required, but will add additional functionality. When walking, Nearby Explorer should be used along with a human guide, dog guide, or cane because does not provide sufficient information to act as a substitute for your preferred O&M method. When using Nearby Explorer to assist a driver in navigating, please ensure that the driver is paying attention to the actual streets, as the mapping information in Nearby Explorer may be somewhat out of date. Via the Google Play site—AVAILABLE NOW! Via the APH File Repository, a part of APH’s Louis Database—Will be available from the File Repository in the near future! Note: This app cannot be purchased directly from the APH shopping site. Note: Nearby Explorer will be available with Federal Quota funds! All Quota purchases must be made via the APH File Repository, the Google Play site cannot be used for Quota purchases. Look for Nearby Explorer on th File Repository soon! Note: The following new products are available for sale now! They will appear on the APH Shopping site soon. You can order them today by faxing a Federal Quota Order Form to 502-899-2284 or by using a credit card over the phone at 800-223-1839. Unlike the Unit Check-ups, included in the student's textbooks, the BOP Second Grade posttest is a separate item that assesses the concepts and skills covered throughout the whole Second level of this braille literacy program. A set of consumable forms are provided in braille for use by the student and in print and braille for use by the teacher in a separate package. The teacher's manuals, available in both print and braille editions (sold separately), give complete instructions for administering and scoring the tests and analyzing the results. An answer key is provided in the back for quick checking. Results can be recorded in an accompanying graph showing target scores for each subtest. This sheet makes it easy to see areas where the student excels as well as areas where remediation may be needed. Building on Patterns (BOP) is a complete primary literacy program designed to teach beginning braille users all language arts -- reading, writing, and spelling. The Building on Patterns series addresses phonemic awareness (ability to hear and interpret sounds in speech), phonics (the association of written symbols with the sounds they represent), comprehension, fluency, and oral vocabulary, all of which have been identified as important for reading instruction. This program also addresses specific skill areas needed by the child who is blind, such as language development, sound discrimination, tactual discrimination, and concept development. Braille contractions are introduced from the beginning along with sound and letter associations. Expanded Core Curriculum (ECC) skills such as using tactile graphics and technology are also included. Prerequisite: Building on Patterns: First Grade or equivalent skills. Recommended ages: 7 to 8 years and up. A hands-on game for baseball lovers and baseball learners! This tactual and visual game is a fun way to learn about baseball and practice numerous other skills. Touch 'em All Baseball is meant for two players (although you may play against yourself). The game is easy to learn, and you may change the complexity for different levels of play. You’ll need to be familiar with the basic rules of baseball for counting balls, strikes, and outs; for advancing runners; and for scoring, but you don't need a lot of baseball expertise to enjoy this game. One player begins by using the Pitching spinner, and the other player uses the Batting spinner; after each half-inning they switch. Thus, both players are involved in the play regardless of which team is at bat. The spinners are divided into sections of different sizes that represent the likelihood of each result happening in a real game. The Teacher's Kit (sold separately) provides suggestions for using Touch 'em All Baseball with students, not only to teach about baseball but to develop other skills. The Teacher's Guide is provided in large print and as a free download in accessible formats. This kit includes a set of tactile/print "stick figure" diagrams, which illustrate the motions of pitching and batting along with some of the spatial arrangements that apply in baseball, and suggested physical activities that correspond to the images. For students who show an interest, consider these activities for broadening their appreciation and tying the game into other content areas such as writing and notetaking; math and measurement; probability; and physical education. Recommended ages: 8 years and up. WARNING: Choking Hazard--Small Parts. Not intended for children ages 5 and under without adult supervision. Tee-ball is a registered trademark of Gospel Projects, Inc. Note: Each Teacher Guide includes a Teacher CD-ROM. Each Student Book includes a Student CD-ROM. This test prep series offers practice for today's standards-based assessments for grade levels 3 through 12. Test Ready®: Plus Reading provides preparation and review, in as little as two weeks before testing day. It also provides a program of instruction and remediation. Test Ready: Plus Reading is a review program that provides practice in test-taking skills in reading comprehension and open-ended writing tasks. The APH Teacher Guides and Student Books are available in several accessible formats, so that the entire class can work on reading together in a multi-media approach. The large print and braille editions include a CD with an .html file and a Digital Talking Book (DTB) file with built-in player. The large print student edition includes a specially formatted large print answer document. However, it is recommended that each student have a book in his or her preferred reading medium, and should feel free to mark answers in the test books. Used this way, the student books become consumable items. 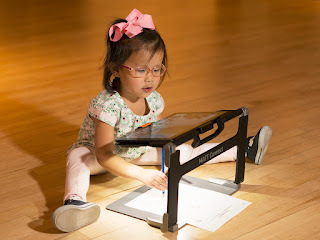 The purpose of these guidelines and standards is to provide transcribers, educators, and producers with information about best practices, current methods, and design principles for the production of readable tactile graphics. The Supplement to the Guidelines and Standards for Tactile Graphics includes 35 tactile graphic examples from the mathematics, science, and social studies disciplines. Designed to make marking multiple choice test answers easier, these sheets can be used for both classroom and standardized tests. Accessible Multiple Choice Answer Sheets have high-contrast layouts with print and tactile elements that engage students so that test-taking can be fun! APH offers three versions of the answer sheets, each sold separately. Fifty generic sheets with question numbers 1–40 in large print and braille are laid out in two columns, with multiple choice braille answers: a, b, c, d, and e. Any approved method of marking the sheets can be utilized, such as crayons, pencils, pens, or braille erasers. If more than 40 questions are on the test, multiple sheets can be used; renumber as needed. Students can press down or erase the number sign beside questions they want to return to later. Formatted in two columns, with bold lines and a highly readable 18 point font, these two-sided generic answer sheets have question numbers 1–40. Every other line is highlighted with a contrasting color to help in finding the correct line. Students can mark with a 20/20 Pen®, pencil, crayon, or other approved writing tool. Post-it® tabs can also be used to mark questions they want to return to later. These sheets provide an engaging new way to make test-taking more fun! "Memory plastic" dots are pushed down to select an answer, but can be popped back up easily, allowing students to change their answers independently. Multiple choice answers a, b, c, d, and e run horizontally. Advanced level student sheets have questions 1–20 in two columns. Beginning level student sheets have questions 1–10. Any combination of the sheets can be used depending upon the number of items on the test. APH offers a number of recreational books in braille (Quota funds can be used). Each of these titles was originally transcribed and produced by APH for the National Library Service which has graciously granted permission for this offering. As usual, these titles have been added to the APH Louis Database where you can find thousands of titles produced in accessible formats. Note: all books are produced upon receipt of orders, therefore, please allow several weeks for delivery. Three novels exploring British class distinctions in the early twentieth century. Loving (1945) contrasts lives of servants and masters in an Irish castle. Living (1929) portrays iron-foundry workers and owners. And Party Going (1939) presents the reactions of wealthy travelers to crowds of lower-class railway passengers stranded by fog.